Destin Party Boat Fishing Family Fun Fishing! Party boat fishing, AKA head boat, is a charter fishing vessel that groups anglers for a fishing excursion. The word "party" is pertaining to the number of groups that are typically on the vessel. Party fishing is very common in the summer season as it's usually a more affordable option for fishing because it's inexpensive. Because there are a lot of anglers on the boat fishing, the price is usually much less expensive than a private charter. On your next trip, consider a party boat trip as something fun to do in Destin, FL! 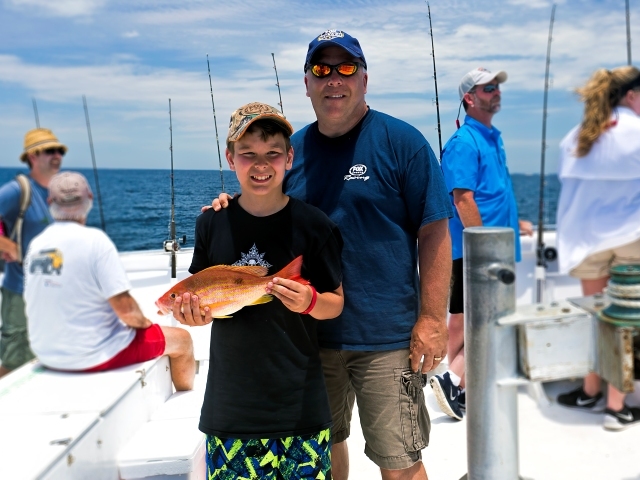 Along with activities like Parasailing, Dolphin Cruises, and Snorkeling, Party boat fishing charters are the most popular type of fishing charters the Destin Harbor offers. The reason the charters have been so popular is because they are inexpensive and they offer first time experiences for new anglers. Most party boats are vessels that are 65ft or larger and hold 48-100 people. Depending on the season, anglers can't catch snapper, grouper, trigger fish, mackeral and many more popular fish species. The mates will clean the fish after the trip for tips. Most Destin party boat trips are 5-7 hours in length and they depart right from the Destin harbor boardwalk. Destin has been coined the worlds luckiest fishing village for its popular charter fishing industry. .
"This is our 2nd time visiting Destin and the last time we booked a private charter for $1500. It was with another company in the harbor and it was a terrible trip. This is when we decided to go cheaper this time because if we are dissapointed again, at least it won't break the bank. To my suprise, this trip went well. We fish for about 2 hours of the trip and trolled/drove around for the rest. The crew took good care of us and we caught a handful of snapper and a couple grouper. There is certainly more driving than fishing, but most charters in the area have to drive several miles to reach the good spots. The conditions were a little rough so we got sick coming back, but a good afternoon nap took care of that. Overall, it was well worth the $200 we spent that day. We look forward to doing this again very soon." "WOW!!!! Thats what comes to mind first. We went as a family of five and all enjoyed it so much. We were able to all catch fish , the people were very helpful and very kind to the kids(always a plus). We are already planning to use the same boat for our next trip!! Thanks!!!" " This was a great deal thanks to the crew members who really helped our girls reel in some big fish and even took the time to show them why a triggerfish is called a triggerfish :-) well worth it!"